Whether your doors slide or open outwards, flush pulls not only make them look elegant in a minimalist style, but can also reduce accidents associated with protruding handles or knobs. This is especially important in settings where young children, the elderly or other vulnerable people could get hurt, but can also benefit any environment, and we have a wide range of flush pulls for sale. If you want to buy flush pulls, you have a good choice of styles and shapes. 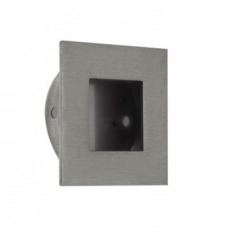 Rectangular models include the 100x50mm Satin Stainless Steel Rectangular Flush Pull and the Pewter Door Flush Pull, while the Satin Stainless Steel Square Flush Pull comes in three sizes, ranging from 30x30mm to 50x50mm. If you’re not so much into straight lines, the 75mm diameter Satin Stainless Steel Circular Flush Pull makes a great alternative, or you could go for the Satin Stainless Steel Ring Pull at either 38 x 48mm or 44 x 62mm. Sliding doors can be a great option, especially in settings with limited space for opening outwards. We supply flush pulls specially designed for sliding doors, such as the award-winning Otto Sliding Door Pull Blanks, in satin nickel, polished brass and satin brass finishes. Besides flush pulls, we have a comprehensive range of pull handles and plates for sale, including pull handles on rose, pull handles on plate, back to back pull handles, bolt through pull handles, face fix and cranked handles, cabinet and kitchen handles, kicking plates and push plates.